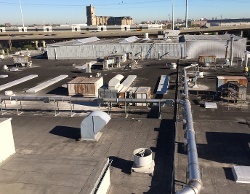 Catalytic Products International (CPI) installed a Catalytic Oxidizer at a Midwest Bakery for the abatement of Volatile Organic Compounds (VOCs). Bakeries generate air pollution emissions from several different processes (including gas combustion). In this application the bakery oven exhaust contains VOC’s like ethanol that must be removed before release to the atmosphere. The exhaust gases emitted from two (2) individual bun ovens were ducted to the new 5,000 SCFM recuperative Catalytic Oxidizer (VECTOR Series). 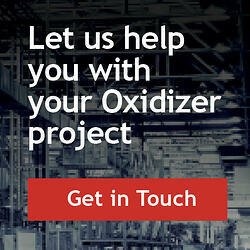 The CPI Catalytic Oxidizer provides a minimum +98% VOC destruction efficiency (DRE) and a thermal efficiency of 70%. Catalytic oxidizers “clean” the process gas by reacting the harmful air pollutants (like ethanol) by providing a surface that oxidizes the VOCs to CO2 and water vapor. The ceramic monolith catalyst provides a surface to promote the oxidation reaction to take place at a much lower activation temperature than normally required to oxidize the VOC, and does not get used up over time. Each CPI Catalytic Oxidizer utilizes a high velocity mixing chamber at the burner, which forces flame impingement and turbulence to occur, providing excellent mixing of the air stream. By designing for the highest mixing, the CPI system can deliver the highest temperature uniformity before the catalyst bed. Temperature uniformity ensures that 100% of the catalyst is efficiently oxidizing the VOCs. When the stream enters the catalyst bed, a catalytic reaction occurs and efficiently oxidizes the VOC’s. The monolith catalyst is contained in a catalyst T-bar frame and incorporates a self-cleaning ceramic guard bed located prior to the VOC catalyst. This design greatly increases catalyst life by prohibiting the active surface area from being coated with particulate matter. A custom designed, floating plate-style primary heat exchanger combined with an efficient combustion system provides a fuel-efficient system, all in one convenient integrated package. CPI provided a complete turn key installation, including design and supply of the Catalytic Oxidizer on a customer provided concrete pad. Installation included stainless steel ductwork, process dampers, booster fan, exhaust stack and an exhaust stack platform for DRE testing. CPI was able to complete a good portion of the installation activities before the new unit arrived on site and delivered the CPI Catalytic Oxidizer fully shop assembled and skid mounted. This approach guaranteed that entire system was installed correctly, and the facility was back up and producing product with minimal downtime. Since 1969 Catalytic Products International (CPI) has worked with a variety of industries including food and beverage manufacturing companies to provide solutions to their air pollution control needs. Today, CPI partners with its customers as a trusted resource in resolving the most complex air pollution and energy conservation problems. We provide our customers with innovative and cost-conscious solutions to their most complex VOC, NOx, and Odor pollution challenges. 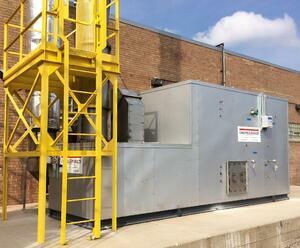 Our equipment is also at work meeting energy conservation strategies and minimizing greenhouse gas (GHG) emissions.